Just how many Irish words do you need to get by in Ireland? The simple answer: none. Literally everyone in Ireland speaks English, and the Irish language is seldom heard in everyday common usage except in the Gaeltacht (Irish-speaking areas mainly on the Western seaboard). But even here, English is generally the language used to communicate with any visitors. Very few people still learn Irish as their first language so speaking Irish like the natives might fall beyond your linguistic abilities, however, it can be fun and helpful to learn a smattering of common words and Irish greetings. 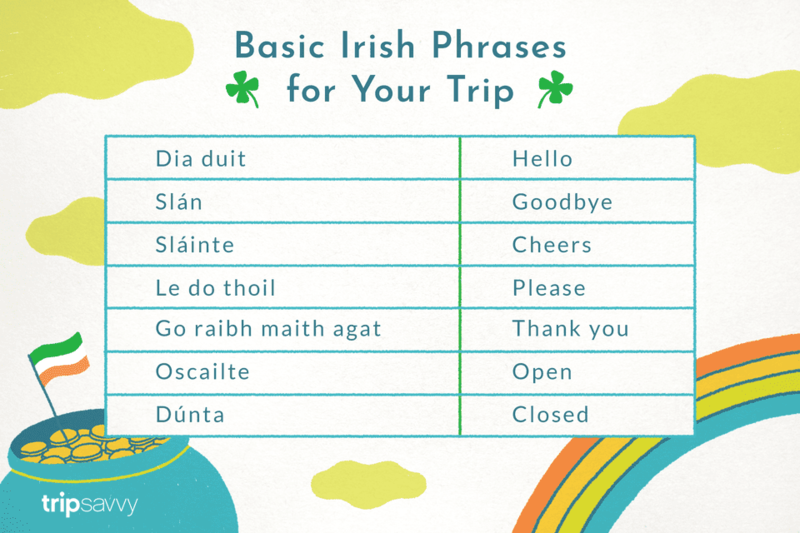 You might, for instance, want to learn some Irish phrases and words in order to avoid coming across too touristy by wishing someone a "top o' the morning," which no Irish person would ever really say. In order to help you navigate Irish conversations, here is a helpful start. You won't actually get an Irish language course, but you will certainly notice that the local lingo can be quite different from plain English. While you might not be able to actually hold a conversation in Irish, you should not feel too bad about that - almost no one can! Having said that, you can definitely spice up your English (and perhaps even find that Irish gift of the Blarney) with some Irish phrases and colloquialisms. This may actually endear the eachtrannach ("stranger"/"foreigner") to the locals. Just don’t expect them to buy you pints of Guinness to honor your effort. How are you? - Conas atá tú? What's your name? - Cad es ainm duit? What's the news? - Cén scéal? See you (later). - Slán go fóill. Stay safe, take care. - Tabhair aire. Cheers to the men and may the women live forever - Sláinte na bhfear agus go maire na mná go deo! Please note that while we have included "yes" and "no" here, this is not entirely correct. In fact, there are no such words in Irish, just approximations like "it is". This might have to do with the reluctance of the Irish to firmly commit to anything in life or just be a linguistic quirk; both theories have some merit. Please - Le do thoil. Do you speak Irish? - An bhfuil Gaeilge agat? How do you say that in Irish? - Conas a déarfávsin as Gaeilge? Say again, please. - Abair aris é, le do thoil. Mná - Women - yes, the big sign "MNÁ" on the lavatory door is not a mis-spelling of "MAN", so beware! Cáisc shona! - Happy Easter! Go n-éiri an bóthár leat! - Have a good journey! Nollaig shona! - Merry Christmas! Oíche mhaith! - Good night! Saol fada chugat! - A long life to you! And How Do You Pronounce These Irish Mouthfuls? You might think "Ah, well, Ireland is next to Britain ... so even if the words are different the pronunciation should be much the same." But if you try to say Irish words using English rules for pronunciation you will probably be met with laughter or confused stares. Irish uses a lot of the same alphabet as English but this is only because a specially developed style of Irish writing failed to become standard. a is pronounced as in "cat", but á is pronounced as in "saw". e is pronounced as in "wet", but é is pronounced as in "way". i is pronounced as in "fit", but í is pronounced as in "fee". o is pronounced as in "son", but ó is pronounced as in "slow". u is pronounced as in "put", but ú is pronounced as in "school". Vowels are also divided into "slender" (e, é, i and í) and "broad" (the rest), influencing the pronunciation of the consonants before them. - pronounced as in "village", it is similar to our v.
- pronounced as in "wall", it is similar to our w.
- always pronounced as in "cut", like a k.
- pronounced as in "loch". - pronounced as in "do" when followed by a "broad" vowel. - pronounced like the j in "joy" when followed by a "slender" vowel. - pronounced like the w in "will" (again). - pronounced as a normal s when followed by a "broad" vowel. - pronounced like sh in "shop" when followed by a "slender" vowel. - pronounced like sh at the end of a word. - pronounced like a normal t when followed by a "broad" vowel. - pronounced like the ch in "child" when followed by a "slender" vowel. - pronounced just like the h in "home". - pronounced like the t in "bet". - pronounced not at all at the end of a word. While the above are good guidelines for speaking Irish, even people from neighboring villages in the gaeltacht (the Irish-speaking areas) don't always agree on the proper pronunciation. You may notice that the Irish tend to roll their r more than other people, even when speaking English. At the same time, the horror of clustered consonants is obvious, the English "film" becoming "fillim" regularly. Oh, and a very good party trick is to have an Irishman read out "33 1/3" which may end up as "dirty tree and a turd". Trying to learn Irish from books is like trying to scale Mount Everest via virtual reality —not impossible but far from the real thing. Even with the help of tapes and CDs you simply will not come up the conversation standard. And, above all, avoid the dreaded Stage Irish of the standard tourists! It makes the real Irish cringe every time. Is Irish Actually Spoken in Ireland?